Looking for whale sharks and mantas in Thailand? There have been numerous sightings of not only Whale Sharks and Manta Rays but also Orcas (Killer Whales) and Thresher Sharks all around the Andaman Sea. 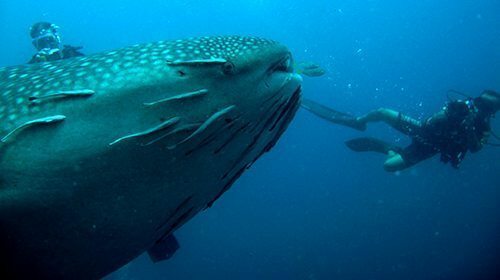 The most popular places to see Whale Sharks and Mantas continue to be Richelieu Rock, Koh Tachai and Koh Bon, just north of the Similan Islands and Hin Deang and Hin Mueang to the south of Koh Phi Phi. But they have also been spotted at Koh Haa, Racha Yai, Similan Islands etc. There is very little for a diver to compare with the thrill of swimming next to one of these beautiful creatures, so large, elegant and peaceful, a fantastic memory to savour forever. If you are lucky enough to encounter one of these amazing giants, it is an experience you will never forget, and a little excitement is understandable so forgetting a simple diving rule is likely: please do not to touch a manta or ride a whale shark. Indeed whale sharks are quite curious and it is more likely that if you do not swim to them, they will come to you! Imagine that! A four, five meter fish coming directly to you to extend it welcome into his world. Very often mantas swim over cleaning stations where small shrimps and fish will eat (clean) the parasites on their skin. The mantas do several passes over the stations and sometimes you can just “sit” there, watching them swimming gracefully over the reef. It is another great moment for divers and one that will highlight your diving trip. Merlin Divers in Kamala can of course organise day trips or liveaboard trips to any of these dive sites.